A few of you have sent me emails in regards to turning your images on your media kits into hyperlinks. In order to make your images clickable and turn them into hyperlinks, you are going to have to add the images via Microsoft Word. It takes a little finesse, but it's so worth it. Having those clickable images makes it much easier for PR people to have direct access to all of your previous work/social media platforms. It's that time of year again. Bloggers are dusting off their business cards and preparing to head to some of the biggest blog conferences this year. Twitter is abuzz various conference hastags, and you can sense the excitement in the air. But before you pack your bags, ask yourself this question. Can you sum up your blog in 30 seconds or less? That's where your media kit comes into play. A media kit is a condensed version of what you blog about, who your readers are, and some of those "fancy" statistics that brands like to see before they consider working with you. A media kit is similar to a resume. Only it's a lot prettier and more fun to create. 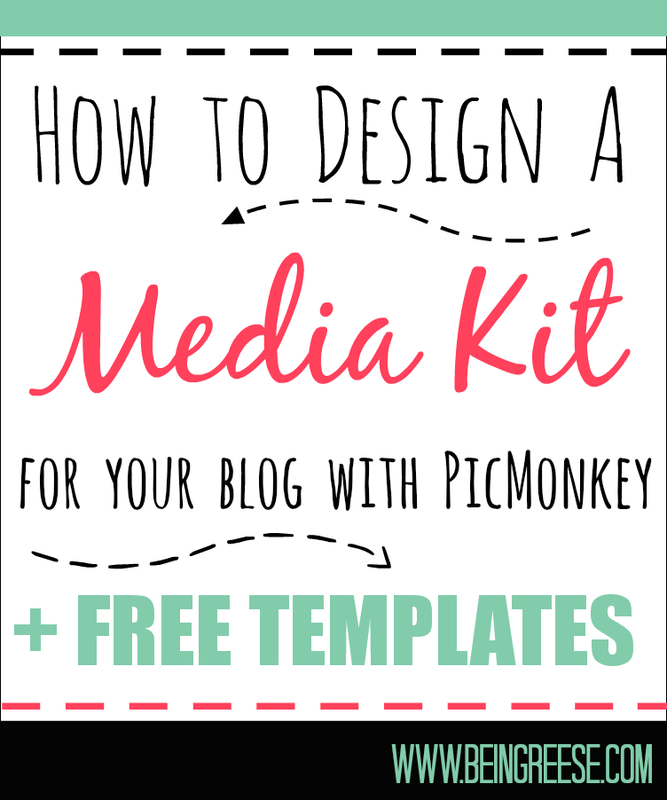 In this post, I'll be teaching you how to create a free media kit for your blog using PicMonkey. Not interested in creating one? That's okay, I also have 5 pre-made templates for you to choose from! Last week we discussed what to include in a media kit for your blog, this week we're going to put all that knowledge to work by creating an attractive media kit that will have the sponsors lining up for you. Did I mention that PicMonkey is free? It requires no downloading, no signing up, and no fees (unless you want to pay $4.99 to unlock all those fancy extras). For this tutorial, I will be using all the features you can find on the free PicMonkey pricing plan. I think you'll be amazed at what this site can do. 1. Start out by going to the PicMonkey homepage and placing your mouse over the design tab at the top of the screen. Don't click directly on design, or it will take you straight into the design studio without letting you select the size of your canvas. Once you see the various sizes for the canvas appear, select the 8x10 size. 2. Once you get in there, familiarize yourself a bit with the layout. You're going to do a lot of clicking and experimenting with your designs. Once you feel comfortable, head on over to the overlay category. You'll find this tool on the left had side of the menu. It will be the button shaped like a butterfly. Once you get to the overlay menu, select the category titled Geometric. Personally, I prefer to use the plain rectangle overlay that is at the top right hand corner. While the other overlays are fun, this is one of the only ones that you can manipulate vertically and horizontally. Once you position your overlay, and fix the size to fit your canvas, you can tinker with colors. 3. Now comes the fun part. The text. The text category is the fourth from the top and looks like an uppercase and lower case t (Tt) I'm going to caution you ahead of time that inserting text onto an overlay can be a bit tricky. If your text is smaller than your overlay, it can be difficult to maneuver it. Typically, to get around this, I will simple add my text, and then drag the right hand side of the text box really far over so that it is no longer on the canvas. Make sure you pull either the right hand, or left hand wall only. Pulling on the corners will make the text larger, and we're just trying to extend the size of the box so that it is large enough for you to click on and maneuver without selecting the overlay beneath it. As far as text, I like to experiment. I like to add various text styles, especially bold, narrow and cursive. I try to include a bit of cursive in all of my images because it looks great mixed in with plain text. It gives it a nice pop. You can change the color and sizes of your text. This is something you will have to play around with. Just avoid anything with a little orange crown next to it, as that is only for members who choose to upgrade. 4. You can add in a photo by clicking on overlays again and selecting Use Your Own. You can insert photos from either your computer, dropbox, facebook or flicker. Once you choose your photo and insert it, change the size by pulling on the corners of the photo. Place the photo where you would like. 6. Now comes the fun part, the part for you to spread your creative little wings and add in various elements that you would like on your blog. I typically add an overlay box under my photo so I can provide my social media stats and contact information in an obvious place. However, this is your kit, so do with it as you will. 7. Remember my last post on what to include in the media kit? Be sure to include: Contact information, a brief "about me" section, demographics and stats, a list of services offered (pricing optional) and previous work you have done for clients. If you haven't done any sponsored work, have no fear, just do a product review on something you own and add that logo to your kit. Try your hardest to only use sponsored work that you have comments on. Remember, you want interested companies to know they will get visibility and interaction on their posts. 8. Once your finished putting in all your important information, save your document. Be sure to save it as a .png. jpeg files look blurry on the internet and .png's tend to look more crisp and fresh. 9. Once you have your "photo" saved. Go to microsoft word and open up a blank document. Click on insert photo and insert your photo into the document. Under the picture formatting tools, choose wrap text, and select the "In front of text" option. This will allow you to place the image anywhere on the document. Also, be sure to change the size of the document so that the media kit spans the document. I typically just type 10.6 into the "shape height" box for images. 10. Once you have your image where you want it, add bullets next to your social media stats, right hand click on the bullets and insert a hyperlink directly to the url you would like the link to go to. Insert any images for sponsored posts that you have done at this point and position them on the document. Turn those images into hyperlinks as well. This will make your document clickable, and will be easier for potential sponsors to navigate your media kit. 11. Once you are done with editing your final document, save it as both a microsoft document, AND a PDF. By saving it as a word document, you'll be able to go back in and update your kit without having to start fresh. 12. Now, just upload your PDF version of the media kit to either google docs or dropbox and insert the url into the sponsor section of your blog. 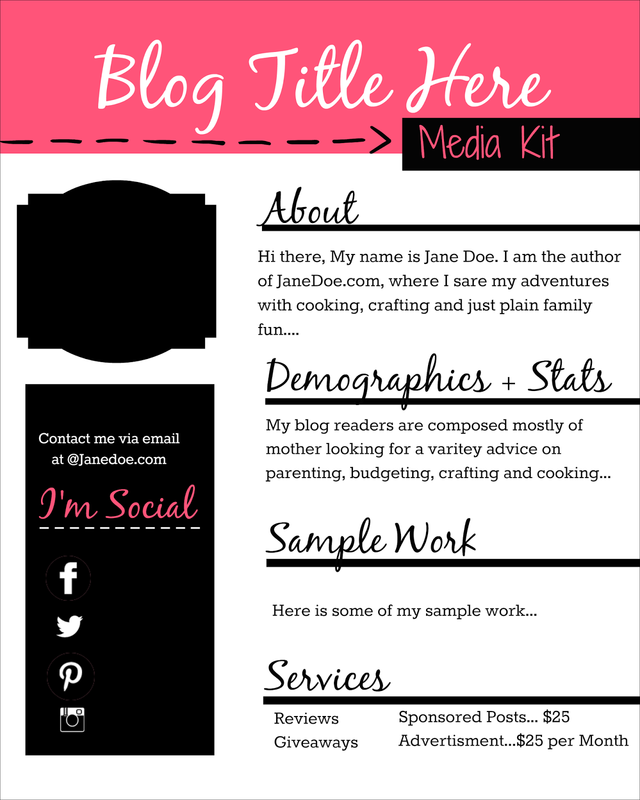 Now pat yourself on the back, you have just created an attractive, clickable media kit for your blog. So in addition to having a hard copy to send to interested companies via email, people who just happen to be perusing your site will now have access to your blog's media kit. And now, for the grand finale, I have put together a few quick templates for you guys to use. In order to use these templates, just save the picture and open it in PicMonkey, and include all of your information. Don't click on the first image, as this is just the sample template and it has text already plugged. In. Once you finish inputting your information into the media kit, follow steps 9-12 to insert direct urls and make your media kit downloadable. If you'd rather skip these steps, that's fine. You will still have a great media kit that you can include in pitches. As always, if you found this tutorial helpful PLEASE share. It takes two seconds to click the twitter button and type something in to share. This way more bloggers will have access to helpful tutorials that could potentially open doors for them as well. Be sure to swing by each Friday in May. I am launching a sweet series called 5 Little Things. Every Friday, we will explore 5 little things that bloggers can do to market ourselves better. From making it easier to connect with PR reps, to crafting the perfect pitch letter, there is something for everyone. Even some you PR practitioners! This is SO helpful omg!! Thank you so much for putting this together and your other post about what should be in a media kit. I'm not really at the stage where I need one yet, but I look forward to making one after awhile as my blog grows (hopefully :D). THANK YOU!!! I am bookmarking this for future use too! You rock! So happy you found this useful! I just gave my media kit a makeover recently and thought it would only be kind to share. Thanks for reading, and be sure to come back and link your kit up when you finally get around to creating one. I love learning more about bloggers and what their passion for blogging is! This is so helpful, Reese! Thank you so much for sharing this! Happy you found it useful! And thank you so much for sharing. I appreciate you taking the time out to share this with your readers! You have outdone yourself! Great post Reese! It's great that you gave the instructions to make it so you can update it as well! Thank Michelle! I should have posted this like a month ago, but I think it was well worth the wait. I love being able to help other bloggers out. I know you're a big PicMonkey fan. 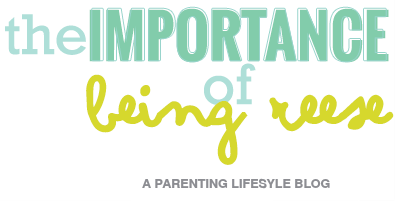 I considered using Canva, but I'm still learning my way around. Maybe for my next update? Thanks for sharing! This is amazing, so helpful...thank you so much for this! No problem Adrienne! I'm happy you found it useful! Thanks! I totally needed this! I have used Pic Monkey a grand total of twice for this quiz thing I needed to do for the blog, but this is a lesson I need very very badly! I love PicMonkey. After this post, I finally upgraded to the Royal membership and am loving it! Happy you found this one useful! I'm planning on posting more blogging tips in the upcoming months so stay tuned! This is such a great set of tips and amazing templates! Awesome Post and Share! So happy you found this useful Mrs. Teeh! And thank you so much for sharing. It truly is MUCH appreciated! this is fantastic Reese!! Great templates!!! You are so dern talented :) Pinning and sharing everywhere! This is awesome. I need to work on a media kit and start getting paid...lol. Thanks for putting this together. Awesome! #11 was perfect. I'm a PicMonkey junkie and didn't think about saving files as Word Docs to edit. Thanks for that tip! You're so welcome Amber! PicMonkey is such a fun tool. I finally stepped it up and purchased the Royal packet and am thoroughly impressed with the additional features. Still, even the free version is amazing! You're so welcome Kristin! I hate to see people pay for something they can do themselves. Plus it's always great to learn new skills. As bloggers, we have to keep expanding our abilities! Great tutorial - definitely sharing. Happy Fri-Yay!! Thanks for sharing Antionette! So happy you found this useful! Thanks Tameka! Be sure to give me a tweet at @reese22 if you find you need some additional help! Thanks for stopping by and getting to know me! I'm happy you liked this one. I have a lot more blogging related tutorials up my sleeves in the upcoming months so be sure to stick around. This is a great tutorial! The only problem I can see is that Google doesn't read the text on images, so it won't be that well optimized for search engines. So it just depends what your main strategy is for getting people to that page. Design is super important, too, of course, and this is a great one! Amazing tutorial! Thank you SO much for sharing!!!! Can't wait to get started! Hi, I'm visiting you via the SITS girls, thank you for the very helpful post! Great share! Wish you the best with your blog. This was an awesome post! Thank you so much for sharing! I'm stuck on step #10 though - not sure how to add bullets/hyperlinks to my social media portions and brand partnership logos. I added them all in during the Picmonkey creation, so Word recognizes my entire document as one big picture. Not sure if I did something wrong earlier in the process, but any feedback would be wonderful! I'm having the same problem. I've created it and uploaded to Word but can't add bullets or hyperlinks. Same problem as well! I am really happy with how it turned out, but I can't add the links! On my to do list. Thx! Thanks for the great tutorial. I'm hoping to go through this more slowly and get started! Great post. 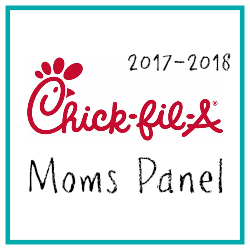 Planning on attending my first this fall. Definitely need this. Thank YOU!! Thanks for sharing! I've pinned and tweeted. Thank you thank you thank you! This was just the guide I needed. I only recently started my blog - I'm about a month in - and while the posts are coming easily, readership + expansion are at a standstill. This is just what I need to start working on next, and all the information I need to get going. Thank you! Thank you so much for this fabulous idea. I had never heard of a media kit before. Love, love, love the templates too. THANK YOU!! I had no idea how to add hyperlinks. I had already created my template in Picmonkey, but so wanted hyperlinks for easy access to my social media channels. You are amazing!! Thanks a million!! I am unable to add bullets and hyperlinks once I get into the Word document. I have double checked and I followed all the instructions exactly. Can you help me out? Very helpful thanks so much! I love picmonkey and need to do my media kit, and this has been such a tremendous help! I just used your template to create mine. Thanks so much! Thank you for the tips and motivation! Question: for your pink template, what font did you use for the different headers? thank you! Thanks so much for sharing this!!! I'm looking to build a MK and this has been very helpful!! Thanks so much for taking the time to put together such a awesome and helpful tutorial. Thank you. Finally did my dreaded Media Kit and you made it so easy. Thank you, thank you. 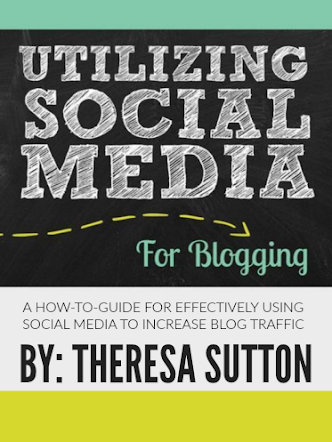 What a wonderful resource for a new-ish blogger. Thank you! This is so helpful. I had no idea what a media kit was until recently. Thank you for sharing. I ran accross this site when googling about media kits. I must say i am impressed. I am going to have to give this a try. I am a amazon reviewer and have my own blog also, still a work in progress. Would love for you to check it out and see what you think. www.kristens2cents.com I definately am saving your blog to read more. and i just subscribed ;) Thanks.